A number of alleged chemical weapons attacks in southern Idlib and northern Hama provinces in the spring of 2017 describe a curious transitional phase between chemical strategies. For context, the first chemical attacks between late 2012 and August, 2013, involved alleged sarin nerve agent, primarily. After the Alleged Chemical Attack, August 21, 2013, Syria agreed to join the OPCW and surrender its stocks of chemical weapons. Then from mid-April, 2014 through early 2017, the allegations were almost entirely helicopter-launched chlorine attacks. The Alleged Chemical Attack Khan Sheikhoun 4 April 2017 would seem to mark the re-emergence of sarin with close to 100 civilians killed by toxins all at once, for the first time in quite a while. But there were preludes, an emergent pattern of foreshadowing and confusing overlap, perhaps suggesting a plan to have sarin re-appear. With chlorine and sarin claims inter-mixed, allegedly inside the same munitions in some cases, and with the events often confused or little-known, this page seemed worth starting to sort them out. There were a few alleged CW attacks in other areas in this span (notably East Ghouta), but they don't seem to play into this pattern in the same way. Here we'll just consider the area around the April 4 attack. Expanding to include April 4 - which as its own pages (plural), but which still deserves a spot here - and so far to April 6, where the same pattern extends - there are 7 or even 8 reported CW attacks known to us in this time and space (March 30 may have seen 2 coordinated attacks). A further two clustered attacks back in December, 2016, also bear mentioning in a section, seeming to relate to this same pattern. 4 March 30, Latamnah and "Al-Zuwar"
Only later, in mid-June of 2018, over a year later, did any word surface of an even earlier incident in Latamnah. The next day's alleged attack (see below) was already widely covered as a chlorine attack. But the OPCW issued a report on 13 June announcing that sarin was confirmed in that incident, as well as in the day-before incident. OPCW Confirms Use of Sarin and Chlorine in Ltamenah, Syria, on 24 and 25 March 2017 OPCW, Wednesday, 13 June 2018. A few details were given in the report (direct PDF link): it was a 5:45 am jet attack, firing a non-chlorine CW weapon, then a conventional explosive, hitting the same basic farmland south of town hit in later attacks. There were no fatalities or serious poisonings mentioned, but "up to 30 casualties, including women, men, and children. There were two groups of casualties: the first group consisted of two families who were sleeping in caves in the southern residential area of Ltamenah; the second group consisted of several men located in the agricultural land outside the city, close to the first impact point." Symptoms reported were most consistent with nerve agent exposure. "One member of the medical treating staff who was interviewed also reported secondary contamination." Witnesses describe no smell at the crater, but a bubbling liquid inside, first water-like and then black. Bellingcat's Eliot Higgins agrees "Unlike the March 25th 2017 chlorine attack, the Sarin attack on March 24th in Al-Lataminah went unnoticed, so the OPCW FFM report is the first information we have about that attack." Syrian Archive likewise has no videos nor even an entry for this incident. Higgins tweeted that this "rather undermines the narrative of CW Truthers ... why do a false flag, with Sarin, if you don't tell anyone?" some analysis here... Dr. Darwish didn't show chlorine signs. In retrospect, it's interesting that the well-connected (to terrorist plots) Dr. Shajul Islam claimed this attack was by chlorine, and by sarin, in the same tweet. (via Qoppa999 shortcut) He's more explicit with this Facebook post and video of the same day: "URGENT! We are getting so many patients with gas poisoning. This attack is from Al Lataminah in Northern Hama. This seems very toxic and has killed a doctor ( Ali Darwish) who was treating the patients. We have seen chlorine gas attacks, but this is not the same. The patients are dying very fast. We now strongly suspect its Sarin Gas. CAN YOU HELP US." UN CoI report, point 64: - chlorine, with usual cleaning products smell, barrel bomb, helicopter - no mention of sarin. The same from early Syrian American Medical Society (SAMS) report noting the loss of their Dr. Ali Darwish. Months later, still no clear claim or confirmation that this was a sain attack like seen soon on 3-30 and 4-4. A year later, we learned this attack may have also involved sarin, and a previously unmentioned one the day before in the same area used only sarin. June 13, 2018 OPCW report, PDF link. Along with chlorine-related compounds, breakdown products from sarin were found in most samples allegedly taken from all over the hospital, but not on the two gas cylinders. However, the report states "the FFM does not attribute the presence of these chemicals to this alleged incident, but instead determines their presence as being related to the very likely use of sarin the day before, and the decontamination of patients at this location." A video cited below on the March 30 attack, declares that's the third chlorine attack in recent days, explaining "On Sunday, March 26, 2017, a medical official at the Al-Latamneh hospital told Smart that a number of civilians, including women and children, and fighters of the Izz al-Din al-Azza of the Free Army had been suffocated following the helicopter's flight for the second day in a row. Contains "chlorine gas poison". The first time was March 25, as addressed above. There's no other supporting claim for a March 26 incident. March 30, Latamnah and "Al-Zuwar"
(and even Kafr Zita?) Mostly, this is reported as in Al-Latamnah, but there is or was another part in a separate town, and that's where the sarin part happened, in one interesting version of events. First, those agreeing on Latamnah as the nerve agent locale. Syrian American Medical Society (SAMS) report it was near Latamnah that "barrel bombs" were dropped, suggesting helicopters. But: "these barrel bombs, in addition to containing the identifiable chlorine gas, were suspected to contain other toxic agents based on the symptoms: pinpoint pupils, convulsions..." (SAMS) The medical experts at Syrian American Medical Society showed their true colors and claimed this: sarin-chlorine barrel bombs were dropped on farm workers. Chlorine is known to destroy sarin, and is a known method for decontamination (mentioned in this 1955 report). If such bomb had been dropped, there would likely be few if any serious cases of exposure. The UN's Commission of Inquiry settles on a different version. point 69: an unidentified jet warplane dropped two bombs around 6:30 am - the first released a chemical with no particular smell, causing sarin-consistent symptoms and secondary contamination. The second caused a blast. Point 70 expands on this, concluding this was a sarin-type attack, not a chlorine type one. Human Rights Watch reports about the same: there was a faint, non-described smell, and powerful effects more like sarin. Yet no one died, of a reported 169 who required medical treatment. "The suspected nerve agent attack in northern Hama on March 30 caused no deaths, but injured dozens of people, both civilians and combatants, according to local residents, medical personnel, and first responders." Abd al-Munaf Faraj al-Saleh, from the "White Helmets," said "When we got there, people were suffocating, some critically. They were trembling, had extreme difficulty breathing, redness in their eyes; some had foam coming out of their mouth. People were going unconscious. Some of them started hallucinating, saying weird things, when they got to the hospital. The chemicals in the missiles had a very mild smell but a strong effect." Hallucinations and "saying weird things" are not sain indicators (nor is "foam from the mouth," really). NYP: "Latamineh — 15 miles from the rebel-held town — was hit March 30 by a missile filled with what appeared to be a chemical agent, causing about 70 people to experience spasms and foaming at the mouth." SNHR report: "[aircraft monitor Mahmoud Al-Hasna] monitored the warplane with the symbol Quds-6 taking off at a similar time before in late-March and targeting a hospital in Hama suburbs with poison gases at that time." That's a similar time to the 6:26 takeoff on April 4. A jet at dawn means this attack, not the hospital one said to be in the afternoon and launched from a helicopter. However: https://www.youtube.com/watch?v=8vIMxgQ0RI8 For the third time in a row, the system is bombarding the chlorine gas in the town of Latamna in the countryside of Hama - posted March 31. Description: On Thursday, March 30, 2017, the regime ordered the chlorine gas in the town of Latamna in the northern Hama region of central Syria. The chemical team leader 114 said that they had helped a number of cases of suffocation to the medical point in the town. On Sunday, March 26, 2017, a medical official at the Al-Latamneh hospital told Smart that a number of civilians, including women and children, and fighters of the Izz al-Din al-Azza of the Free Army had been suffocated following the helicopter's flight for the second day in a row. Contains "chlorine gas poison". Shown in that video: the chlorine tank from 3-25 attack, a new one in a field, and pieces from another unidentified device (the sarin bomb? ), perhaps similar to those seen in Khan Sheikhoun. Guys in hazmat suit (one marked training) carry a red skull placard into the field. Possible location for the mystery remnant: just S-SW of the cave hospital. (Kobs) However, the fragments seen are not in a clear context and could be somewhere else. The visited site is clearly here, with strangely blackened and flattened vegetation, and at least one similar cone-shaped fragment. As noted, there was a supposed March 26 chlorine attack prior to this, so it's quite possible the chlorine tank is from that incident and not from the 30th. However, the video still adds, in its title and description, to claims of another chlorine attack. But since it's not reported as in addition to something sarin-like, it could be they're just repeating the usual formula - more chlorine (presumed). The same would happen for Khan Shekhoun on the 4th - initial reports claim chlorine, maybe just out of reflex. "toxic gases: Meanwhile, medical sources in the northern province of Hama said dozens of civilians and medical personnel were suffocated by aerial bombardment of aircraft believed to be Russian, targeting missiles with toxic gases in the town of Latamna in the northern outskirts of Hama." The injured were taken to hospitals on the Syrian-Turkish border, the sources said. Dr. Mahmoud Abbas, from a hospital in northern Hama, confirmed that he had received symptoms of chemical poisoning, that they were being treated and that critical cases had been transferred to nearby hospitals. The (Masar) news agency reported that Russian warplanes carried out missiles with toxic gases on the town of the visitors (alzuwar - الزوار ) in the northern Hama countryside. The Assad helicopter also carried drums containing chlorine gas on the towns of Latamna and Kafarzita, leaving dozens of civilians trapped." "Masar Press reported that the opposition fighters withdrew from the towns of Arza and Shikha and point 50 in the northern Hama countryside after targeting the regime forces the region more than two hundred rocket and space (guided?) missiles and toxic gases for 48 hours." "The agency also said that the opposition forces also withdrew from the towns of Mughayar and Breidig in the western countryside of Hama after the night of the night of the two towns and killed more than 25 elements of the regime forces and the destruction of a tank and heavy machine guns." Point 50 is due north of Zawr Al-Ballah. Arzah is just south of the same town. Al-Shayah (same Arabic name, different translit.) is just south of that, on the highway at the NE edge of Hama city. Ooh. They were that close. The other two places mentioned are next to Kernaz, some distance north of that scene, withdrawn, but not under alleged chemical attack there. The southern areas and nearby Zuwar/Zawr towns on one map, here on Twitter. These and the northern ones are all along the river, and there's at least one more Zuwar town between them, so... it means somewhere along this river, unclear without further details or geolocation. Russian warplanes carried out missiles with toxic gases on the town of the Al-Zuwar in the northern Hama countryside. 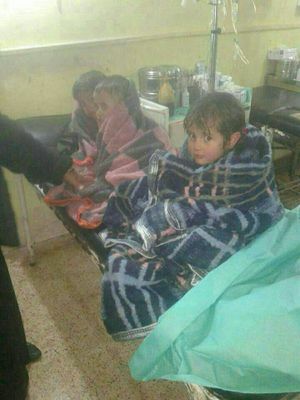 The Assad helicopter also carried drums containing chlorine gas on the towns of Latamna and Kafarzita, leaving dozens of suffocations among civilians. ... In the same context, the correspondent of "Masar Press" that the rebels withdrew from the towns of Arza and Shikha and point 50 in the northern Hama countryside after the Assad forces targeted the region more than 200 raids with space rockets and toxic gases for 48 hours. In summary, by this little-repeated version, so far, the pivotal sarin-confirmed part of the day's attack was not in Latamnah, but in another town or area along the river, probably south of there, along the rebel retreat route from Hama suburbs. Last we heard that detail, it was thought to be Russian airstrike that did it, and the chlorine tank we see was dropped separately by the Syrians in Latamnah. So, as Al-Jazera heard, Syrians dropped chlorine AND Russians dropped sarin at once. 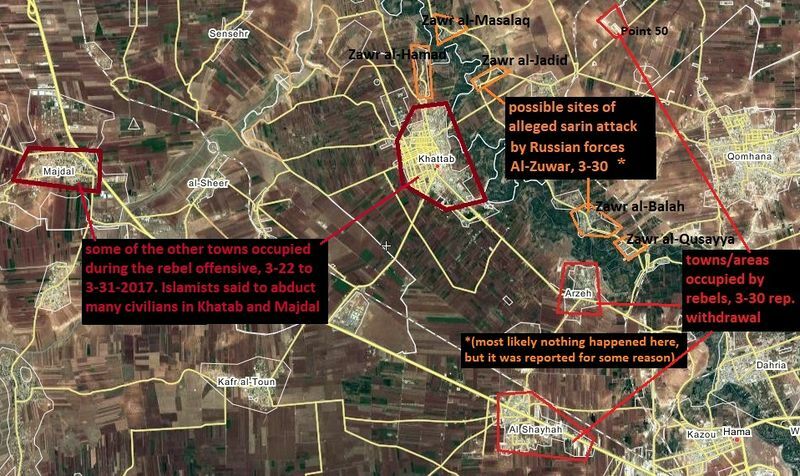 Most likely nothing happened in "Al-Zuwar," but it was reported for some reason. 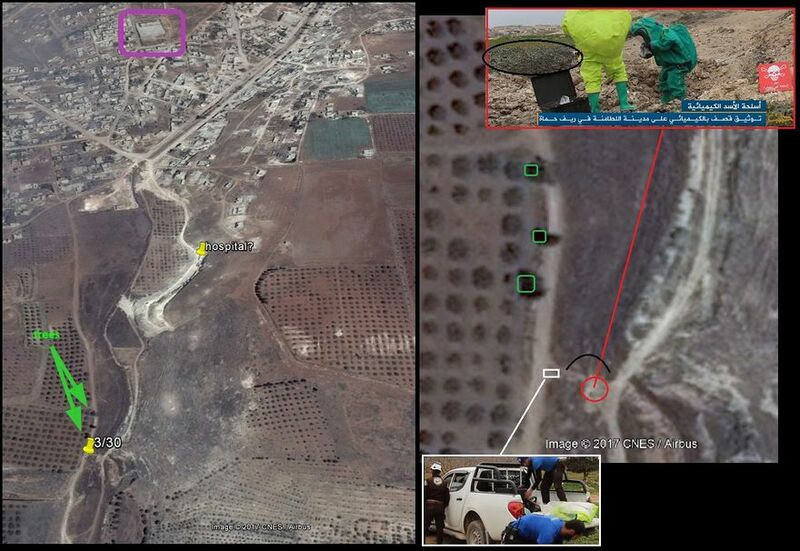 In fact, it seems to be the sarin impact point that's geolocated to south of Latamnah, while the chlorine tank in unplaced (and could still be from the March 26 incident that lacks visuals otherwise). Context (see also below): this was just as Nikki Haley was set to announce Assad's departure was not a prerequisite to solving the Syria crisis. This was the same morning, Washington time, so hours later - but maybe these parties knew they were about to get a *green light* from Trump, and had to go and do this tag-team chemical attack that killed zero in celebration. ... and then of course after thinking it over, Syria decided they really were invincible, and had to do it a few more times and then really do it good on April 4, suffering the first openly intentional direct US airstrike of the war, and ... wondering "is that entrapment?" Anyway, if these are the sleeper allegations, it's big news; both governments will be implicated by a shoddy mix of vague science and unverified "testimony." Zor al-Mahruqah on Wikimapia. A white helmets guy told them two sarin bombs were dropped, apparently one in Latamnah and one at the other site. "The Bellingcat Investigation Team has found no additional information about this second alleged Sarin attack on Zour al-Mahrouka." According to the information above, it seemed to be a different al-Zuwar town that was hit in the first version; The area around Arza and Shikha and point 50 was subjected to "toxic gases", as Masar Press heard, suggesting the "toxic gases" dropped on "Al-Zuwar" was in that area. But perhaps this is a coincidence, and some poison was (allegedly) used on the frontline, as sarin was used at Zor al-Mahruqah, and as everyone reported, south of Latamnah (three alleged uses). Or alternately, the alleged second sarin attack keeps moving around. UN CoI report: "at least 85 people" were affected by the chemical release, suffering symptom more-or-less consistent with nerve gas exposure (at least if your question were if it might be chlorine). Human Rights Watch: "The Syrian American Medical Society said that its affiliated hospitals in the area treated 169 people for injuries due to chemical exposure, but that there were no fatalities." 85 vs. 169. It seems interesting that the SAMS number is almost exactly twice that reported to the OPCW and UN. Did someone stutter? And who were they? UN CoI: "Among the injured were 12 male farmers located 300 metres away from the impact point, 2 of them minors." There were also "nine medical personnel who treated patients without protection," so only "at least 85" minus 9 = 76+ people in the attack area the medics went to help. Only 12 of these 76 are explained here. HRW reports on its number twice their size: "One of the witnesses said that the majority of those injured were members of armed groups, but that civilians in the area were injured as well. ... one was a woman." (and probably zero girls - one female to 168 males, some majority of which are militants who happened to be downwind of this alleged CW impact...) Others affected include "seven medical staff and two ambulance workers who suffered from secondary exposure." This same nine is not doubled but consistent between reports. So the added portion in the HRW total might be 84 unmentioned militant, which would be a slight majority of site victims, to the 76 ... civilians? With only 12 of them described as farmers? Or is that other half also mostly militants? Unclear at this point. HRW continued: "(SAMS) said that nobody had died in their hospitals, but that four people had been placed in the intensive care unit." A witness says he saw a 15-year-old neighbor boy collapse as he stepped outside, and that same boy happens to be the worst off - not dead but still in a coma on life support as of April 11. It's quite likely he's since died. That witness is given as "Anwar Rahmoun, a farmer who lives on the outskirts of al-Lataminah," somewhere with nearby neighbors, not in a lone shack. Looking around, the nearest such spot is about 330 meters northwest of the suggested impact area. So perhaps the wind direction, or the alleged one. It would be mainly uphill, would disperse, and would need a fairly strong wind. The distance is what HRW gives for where a large number of fighters and some civilians were (and it's still not clear why). Rahmoun says he was affected, managed to run a ways, but passed out, had foam from his mouth, seemed dead for 7 hours, but then recovered to relate these details. Victims seen on video: One woman is shown on most videos, with dirty or smoke-stained hands but clean face and immaculate clothes - see Halab Today, 1:02. She displays no outward signs of breathing troubles or anything else except an a calm and cooperative attitude, and some apparent worry. That's the one female. 168 affected males were reported. SMART news 0:08 a medic gets oxygen, as blue oxygen tanks are carried around the cave hospital clinic. A young boy is carried in, the only patient seen in this room (same video, 0:45). He shows no breathing problems, but an unrelated left arm injury (suggested) is heavily bandaged. There's no sense here of any hectic mass activity in the next room. That's it for most videos. One located video from Idlib Health shows several militants in a proper-looking hospital, perhaps in Idlib. The HRW report includes a photo of a victim's eye, showing constricted pupil (with bright lights also involved). That victim looks like a lightly bearded fighter. This report explains the sarin findings, shows photos of numerous metal fragment taken as from the bomb, which tested for sarin and metabolites, gives some incident details and doesn't give others. * earliest tweet, 8:06 pm in Syria: (translated) "Bombard alhabet now with chlorine gas"
photo tweet, 11:03 PM, and later tweet, the latter explaining (in Arabic) "these are the children of martyrs Abdulrahman and Bara al-Dibous, two brothers, after they were hit by chlorine gas in Habit. Displaced from Latamnah." See below. http://syriasolutions.com/?p=2105 Arabic article... Incorrect photo of a girl victim from an alleged chlorine attack last year. Witness in SNHR report on April 4 attack: “The symptoms are completely different from the ones caused by the chlorine gas, which we bombed with multiple times before; most recently in al Habeit town 12 hours before this massacre"
Symptoms of Al-Dabous Children: unspecified sadness. No chlorine indicators like red eyes, irritated skin, or any sign of coughing, respiratory distress, or physical pain. 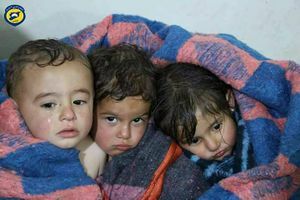 They've been washed off with water as if contaminated with sarin, and their cheeks are scrubbed a bit pink, but their eyes are bright white. 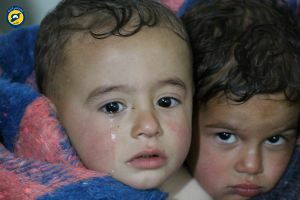 As noted above, an April 3 tweet by Yahya (in Arabic) "these are the children of martyrs Abdulrahman and Bara al-Dibous, two brothers, after they were hit by chlorine gas in Habit. Displaced from Latamnah." The language isn't clear but the twitter user Yahya explains the men " were killed by Russian shelling while working at a construction site" in Latamnah, which was around 4 months earlier. So just the children (plus other family, presumably) were displaced, and later exposed. But the displaced part is interesting. It comes up a little too-frequently for comfort in these chemical incidents. VDC records: All Idlib deaths April 3 = 4 civlians killed by warplane shelling: 2 men killed in KS, 2 children named Aboud killed by shelling in Habeet. No woman is listed. No chemical victims are listed. No Abdulrahman and Bara al-Dabous is listed, from here or anywhere, killed by any cause, in the relevant span. Instead, as Yahya says, they're listed by VDC on November 22, 2016: Abdulrahman Muhammad Hoeo "Dabbos" age 32 and Barra Mahmoud Hoeo "Dabbos" age 24. Both killed by Russian troops bombing, as Yahya says while working together on a construction project. Generic video provided. The Dabous part is in quotes, as if "also known as," but not their real name, which is Hoeo. But those children are said to be of this family, and furthermore, Al-Dabous appears once in related VDC records for deaths - Abdelrahman appears next to it. Son of Abd al-Rahman Mahmoud al-Hoyo "al-Dabous" - photo: red-faced newborn/infant, perhaps left face-down - Area \ Place of birth: Hama, Lattamna - Martyrdom location Idlib: Habeet - Cause of Death: Chemical and toxic gases - - Date of death 2017-04-07 (presumably means listed this day, but perhaps another event or delayed death). So a baby son of a guy of a given name is listed, with the Hoyo-Dabous ambiguity included. This baby appears younger than the three shown as surviving children of this man and/or his killed brother. In fact, newborn... Yahya says he died in the womb. So the mother was pregnant at the time her husband died and she became displaced with the the other kids, sister-in-law, etc. If her baby then died in the womb, it seems worth asking if she's the woman who died "in the shelling," while the baby died "of chlorine." Previous Al-Dabous Deaths The VDC lists 11 people of this name who have died in the course of the war. (Arabic martyr's list - checking "otherstatistics" for army, pro-gov. civilians etc. no results.) Of these 11, all but the 4 are from Zakat village, just northwest of Latamnah (Wikimapia) The first was 4 killed (two women, a boy, and a girl: Rama Khaled al-Houyo) in shelling on the village May 19, 2013 (the boy Mustafa Khalid al-Hoew died the next day - shared middle name suggests they're siblings, with a father named Khaled). The next is a FSA rebel from Zakat killed in Aleppo, in an ambush, August 22, 2013. A 7-year old girl (Salam Khaled al-Houyo) died June 7, 2014 from shelling, after being displaced from Zakat to "Hama: Zour Alhiseh." Another child of a Khaled al-Hoyo - that's 3/3. Next is Odai Khaled al-Hwayo, age 8 from Zakat, killed perhaps there (unspecified), by "regime air forces' shelling" on August 29. 4/4 kids of ... how many Khaleds? Next: the two "Al-Daous" brothers in November, then Ahmad Jihad al-Hoyo, a child soldier with "FSA," age 17, from Latamna, killed March 13, 2017 fighting in Aleppo, "in the surroundings of Kweres military airport." ([https://syria.liveuamap.com/en/time/13.03.2017 LiveUAmap shows only 2 sides fighting here, so "FSA" means ISIS). Then finally the "Al-Dabous" baby. The Assad helicopters also renewed the bombing of the city of Al-Tamamneh Bramil (Al-Latamna?) containing the gas also, which led to the occurrence of suffocation, knowing that a few days ago targeted the hospital of Tamamneh Bramil containing poison gas also, which led to the martyrdom of the doctor, "Ali Darwish." The HRW report fails to mention any attack in Habit, instead reporting on the one in Latamnah: "a helicopter appears to have dropped at least one munition with chlorine on al-Lataminah," citing "a local journalist, a first responder, and a local resident, and a statement by the opposition-run Idlib Health Directorate. HRW's sources reported 12 to 22 cases of exposure, and no deaths. The opposition VDC records for all Hama deaths April 3 one man and one boy, neither in Latamnah. As noted above, the only Latamnah people to die this day were first displaced to Habit, Idlib, and killed in that chlorine attack. April 6: "In the province of Hama, Masar Press and activists said the helicopters bombed the system today the town of Lathamna gas is believed to be chlorine poison. The sources explained that this caused the death of a person and the occurrence of suffocation among civilians." VDC records no chemical deaths this day, unless that means newborn or unborn Son of Abd al-Rahman Mahmoud al-Hoyo "al-Dabous" He's from Latamnah, listed as dying on the 7th, not the 6th, and in Habit (west of Khan Sheikhoun), where other children of a Dabous family, dosplaced from Latamnah, were said to be exposed to chlorine in the April 3 attack in Habit. Presumably, this boy was just listed late, but here's another chlorine attack in his hometown at about this time said to kill someone. March 23: the well-connected (to terrorist plots) Dr. Shajul Islam is at a cave hospital and tweets: "as the battle to free #Hama continues, we are saving lives from a cave on the frontline. Dua (assistance) requested. "(Qoppa999) Visually matched to Al-Rahma cave hospital in Khan Sheikhoun. (Qoppa999) He's probably treating wounded fighters. March 24: a sarin attack no one mentioned at the time effects some men in a field, and families "sleeping in caves" on the southern edge of Latamnah. March 26? : Shajul Islam claims "I am so unwell now. Not sure what it is. I have been treating so many patients from chemical attacks this week without any sort of protection for myself or others around me. We just don't have any." He says he's been working two weeks without a break, except of course for these appeals, at least. Note: We know of one two chlorine attacks by this point, one of them on this day, and no sarin ones. Chlorine causes no secondary exposure. March 30, morning (Syria): first reported attack that openly claimed or tested positive for sarin (at the time). By March 31: Islamist forces have fully withdrawn from the occupied Hama villages they overran over the preceding weeks (again, it's reported, taking many hostages with them). April 4: media campaign begins; White Helmets chief Raed Saleh calls on the UNSC for a stop the chlorine barrel bombs, "by introducing a 'no-fly zone' if necessary." (some tweets promoting it, another) This is overshadowed by the deadliest CW attack in years, now using sarin. Shajul Islam is now clear that it's sarin, showing constricted pupils. Sarin is later confirmed to be in some samples. April 6: U.S. airstrikes on Shayrat airbase, from which the April 4 attack was allegedly launched. Kafr Zita helicopter-chlorine ~6:30am ? ? "Al-Zuwar" Hama jet-missile-sarin (Russian) ~6:30am ? ? Al-Habit helicopter-chlorine ~8:00pm 20+ 0? displaced newborn? This page was last edited on 6 August 2018, at 08:19.